Flo-Grout 3 is pre-mixed, pre-packed chloride free cementitious grout. It contains cement, selected additives, well graded, and non-reactive aggregates and is designed to give excellent flow properties, shrinkage compensation, frost resistance, and high compressive strength. Stanchion bases, struts, railings, and guardrail assemblies. Filling of shutter tie rod openings. Anchoring of tie bars, and bolts. Approximately 13.5 – 14 liters/ 25 kg bag depending on consistency. Flo-Grout 3 can be applied in a single layer at thickness between 10 - 100 mm. For greater thickness, an 8 – 12 mm washed aggregate should be added at a ratio of 15 kg of washed aggregate to 25 kg of Flo-Grout 3. 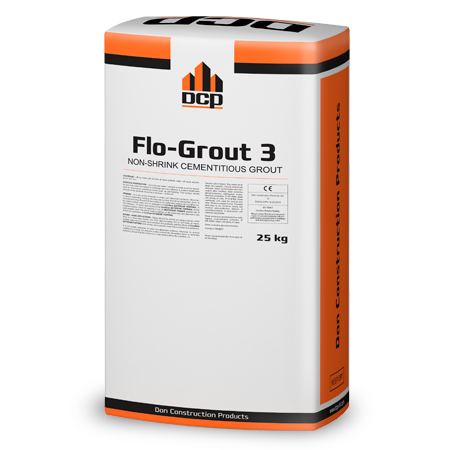 Flo-Grout 3 has a shelf life of 12 months from date of manufacture if stored at temperatures between 2°C and 35°C. The technical data are specified at 22 ° C.
The substrate should be sound, clean and free from contamination. Surface Laitance should be removed by acid etching. All surfaces should be soaked with water enough to reach saturated surfaces prior to grouting. A water tight formwork should be erected to avoid any grout loss. To ensure proper mixing, a mechanically powered mixer or drill fitted with suitable paddle should be used. For a flowable consistency, the addition of 3.5 - 3.6 liters of clean water should be added to clean container. The 25 kg powder is then added slowly to the water while mixing continuously with low speed mixer/drill (400 - 600 rpm). Mixing time should be continued for 3 minutes until uniform consistency is obtained. Enough material should available to achieve continuous fill and to complete the work. Pouring of the mixed grout should be started from one side only to avoid air entrapment. To obtain maximum flow distance, a side Shutter feed between 100 - 250 mm high should be erected and used to build the required head. As the mixed grout posses high fluidity characteristics, all formwork and shutters should be water tight. This can be obtained by sealing underneath the formwork and at the joints by using an appropriate mastic. The unrestrained areas should be kept to a minimum due to the expansive nature of Flo-Grout 3. As Flo-Grout 3 is a cementitious based material, it should be treated in a manner similar to concrete. Curing can be conducted by either using concrete curing compound such as Setseal 22 or by using wet hessian and polyethylene. At low temperatures (below 8⁰C), warm water is recommended to achieve the early strength. And the formwork is recommended to be kept longer time. At high temperatures (35⁰C and above), cold water (less than 20⁰C) must be used for mixing. All tools should be cleaned immediately after finishing using clean water. Hardened materials should be cleaned mechanically. As Flo-Grout 3 contains Portland cement, Flo-Grout 3 may cause irritation to skin or eyes. In case of accidental contact with eyes, immediately flush with plenty of water for at least 10 minutes and seek medical advise if necessary. For further information refer to the Material Safety Data Sheet. 152 Prof. Tsvetan Lazarov blvd.